The Deluxe ISG400DAH uses advanced Heart Sense® technology to "sense" exactly how high to inflate the arm cuff, automatically adjusting for each individual user. Cuff inflation is fast and comfortable, avoiding over-constriction of the arm. Amsco Reliance 333 washer disinfector. For automated cleaning, thermal disinfection, and drying of reusable general surgical instruments prior to sterilization in outpatient/same-day surgery departments, surgical centers, and ambulatory care centers. A wide variety of surgical instrumentation and containers may safely be processed in the Amsco Reliance 333 including: reusable, general surgical instruments, minimally invasive surgery (MIS) rigid instruments, and microsurgical instruments. The Reliance 333 Washer/Disinfector is a single-door, counter height washer/disinfector, designed for installation under-counter or as a freestanding unit (with accessory panels). Convenience without compromise in an automatic endoscope reprocessor. The ASP Automatic Endoscope Reprocessor (AER) with printer is a simple-to-use, fully automated flexible endoscope reprocessing system that provides a safe, convenient working environment. An expanded basin provides sufficient depth for complete submersion and simultaneous processing of 2 flexible endoscopes with less coiling—and less damage—of delicate instruments. Self-contained and compatible with all major brands of flexible endoscopes as well as established protocols for endoscope reprocessing, the AER incorporates a hydrodynamic spray tower and built-in air compressor that provide thorough cleaning and drying of endoscope lumens. Advanced water filtration system assures quality control. 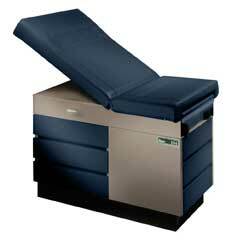 Mimark Ritter 104 medical exam table. It’s in perfect condition hardly used, 6 years old. Patient positioning is easy with the Ritter 104 Examination Table. Its spring-assisted backrest means no more pulling or lifting patients into position. Hide-away stirrups pull out and lock in numerous positions. The 104 can be customized with numerous accessories. The 104's versatility is further enhanced with an electrical receptacle non-skid locking footstep and five large drawers for storage. Specifications: Dimensions top: 27" W x 54" L 68.6 x 137 cm Length with foot extension: 72" 182.9 cm Height: 32.5" 82.6 cm Paper roll holder hidden: 21" 53.3 cm Soft-Touch. STERRAD 50 Sterilization System. Manufactured by Advanced Sterilization Products which is a Johnson and Johnson company. In great shape and has been well taken care of. Their has never been any problems with this system. The unit is 5 years old and is in great shape. We are looking for offers on this used unit. Click here to see complete breakdown.